One of the most highly decorated serving RAF pilots, Alex ‘Frenchie’ Duncan DFC AFC BEng RAF is accustomed to having his leadership and nerves tested to the limit. He has been involved in some of the most daring and dangerous missions undertaken by the Chinook force in Afghanistan. As an approachable and humorous character he speaks engagingly about leadership, teamwork and decision making under pressure. His material can illustrate training messages on team working, motivation in the face terrible odds, leadership, contingency planning, 3rd order effect, using operational examples from his missions in Afghanistan. His experiences and tales of life in an active war zone are recounted in his critically acclaimed book ‘Sweating the Metal’, published in 2011. Born in France to a French mother and a British father, he grew up there before attending Manchester University to read Aerospace Engineering. Sponsored by British Airways Engineering, he then worked on Concorde for a memorable two years. 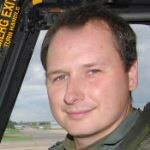 Joining the RAF in 2000, he completed his Rotary Wing Training and received his pilot wings in 2003. He was posted to the Chinook Force and with further training became a Qualified Helicopter Instructor in 2008. He has completed operational missions and tours in Northern Ireland, Iraq and Afghanistan, accumulating almost 3,000 hours flight time in the Chinook. Between 2006 and 2012 he was deployed to Afghanistan seven times, achieving more than 1,000 hours of combat missions. He lead aircraft formations on assaults directly into enemy territory, supporting both conventional forces and Special Forces. In May 2008, Frenchie commanded a Chinook that was ambushed by the Taliban in a deliberate assassination attempt on the Governor of Helmand province. An RPG damaged part of a rear rotor and the rear engine was hit by machine gun fire leaving the aircraft badly damaged. His exemplary flying and professional determination saved the 16 civilian passengers on board. Undeterred 6 days later he lead a second wave of Chinook helicopters delivering paratroopers against a tenacious enemy, an action which tilted the balance in favour of the coalition forces during this battle. His leadership during those two actions saw him being awarded the Distinguished Flying Cross by Her Majesty the Queen. During his tours Frenchie also performed rescue duties as aircraft Captain of an Immediate Reaction Team. Two separate rescues on a moonless night with visibility reduced to just 200m, by a dust storm, resulted in him being awarded the Air Force Cross in 2011. After a promotional staff tour between 2012 and 2014, working closely with Boeing Helicopters, Frenchie is training to become a Qualified Flying Instructor to take over the Oxford University Air Squadron on completion.